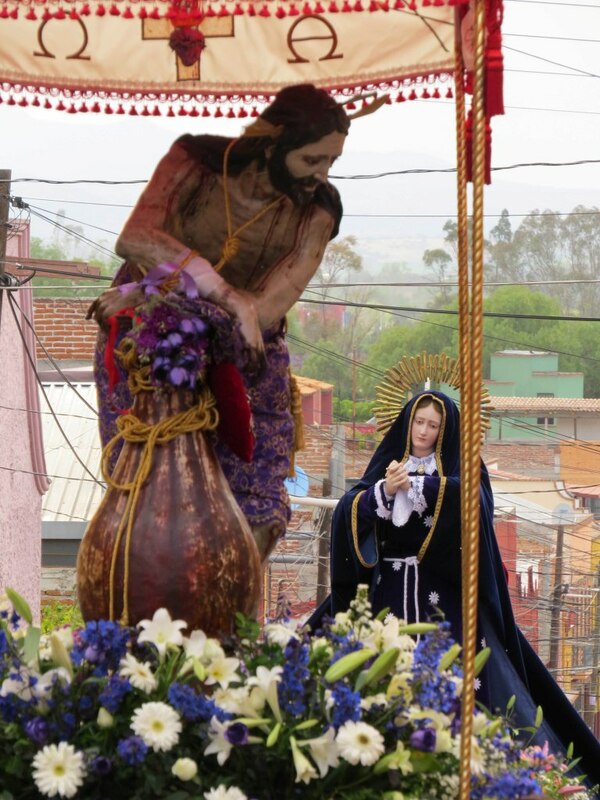 Beginning at midnight in a procession of thousands of people, this life-sized figure of the beaten and bloody Christ is carried from Atotonilco to San Miguel on the shoulders of the faithful. The statue is very old and molded from traditional Chichimeca materials—corn stalks, corn starch and powdered orchid bulbs in 1823 by Father Remigio Ángel González, parish priest of Atotonilco. 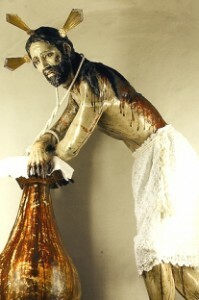 Christ leans against a column for support. He wears a loincloth and on his cheek is the kiss of Judas. For the procession, hundreds of silk scarves are brought by local women and lovingly draped across his battered body along with images of St. John and Mary, as Our Lady of Sorrows. Afterward, the scarves will be removed and safe-guarded for funerals and other religious ceremonies later in the year. 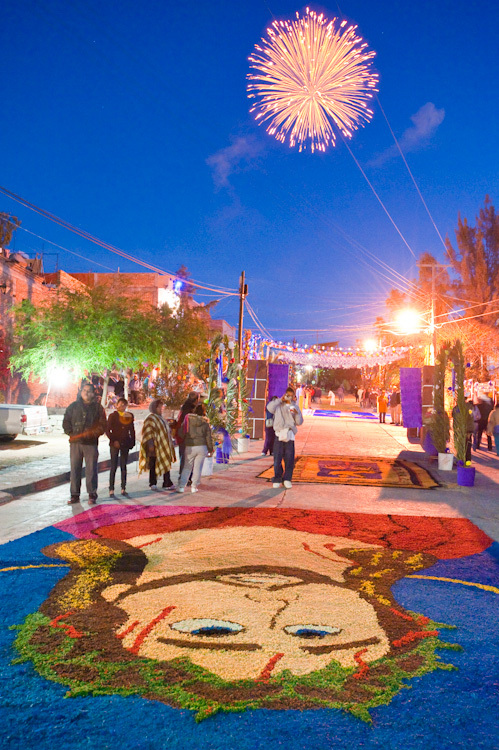 Along the way, the statue will be greeted by purple and white paper flowers adorning every home, the colored and intricately cut banners called papel picado and balloons strung on wires across the road. Anyone willing to show respect is welcome to join the procession that marks the beginning of the events of Holy Week at any point along the route. As the group winds its way towards town, it stops for prayers, hymns and a mass at Cruz del Perdón, near Taboada. Finally, it enters the northern edge of San Miguel, heading for the San Juan de Dios Church amid the deafening clang of church bells and crash of fireworks. To enter Avenue Independencia is to experience a multimedia experience of sights, sounds, and smells. Artists stay up all night creating intricate murals of seeds, plants and flowers that release aromas as re- enactors of Roman soldiers and Jesus enter town. In early 1800 an epidemic broke out in the city after the image was sculpted, and it was brought in procession. The miracle of ending the plague was requested of Our Lord of the Column and granted. That is why the procession continues after almost 200 years. Originally, the procession was to terminate in the Parroquia, however, the statue was too large to fit in the door so the route changed to San Juan de Dios Church. The statues remain for three weeks then return home to Atotonilco. Today, along with the original statue, are two copies normally kept at the Church of the Third Order (next to St. Francis Church) and the Oratorio.